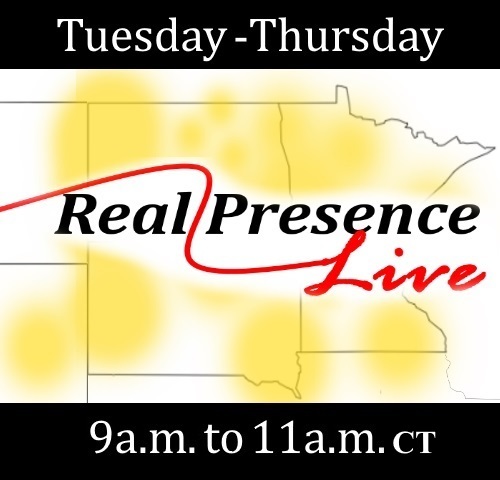 We bring you local hosts and guests from across the diocese of Fargo, Bismarck, Crookston, Rapid City, Duluth, Superior, New Ulm, Sioux Falls, Winona-Rochester, and Cheyenne. In the first hour, host Msgr. Patrick Schumacher began by visiting with Rebecca Lengenfelder and Ali Splonskowski, the mother-daughter team from Cut the Cake in Bismarck, about fall baking tips and ideas. Monsignor then visited with the Diocese of Rapid City's Fr. Leo Hausmann about praying for souls and visiting the graves of our loved ones, especially on All Souls' Day. Finally, our host joined Dan Goshey to talk about his upcoming ordination to the permanent diaconate in the Diocese of Duluth. In the second hour, hosts Fr. Charles LaCroix and Roxane Salonen visited with the Diocese of New Ulm's Bishop John LeVoir about the Communion of Saints and why it's so important to us as Catholics. BriAnna and Kyle Wanner also joined our hosts to share their incredible story of how they ended up celebrating the 100th Anniversary of the Miracle of the Sun in Fatima, Portugal, with the help of our Blessed Mother. In the first hour, hosts Fr. Charles LaCroix and Roxane Salonen began by talking with Sonia Mullally, Bismarck Diocese Director of Communications, about her love of writing and some tips to help your creativity with writing flow. Fr. Charles and Roxane then spoke with Andy Milam about the Shrine of the Grotto of the Redemption in West Bend, Iowa. Finally, our hosts had the chance to visit with Chris Motz, Executive Director of the newly formed South Dakota Catholic Conference, about his journey to this position and some things to watch for as a new legislative session begins in January. In the second hour, Krista Fremming joined hosts Andy Shaw and Fr. Michel Mulloy to share her emotional journey of having an abortion, living with that pain, and finally finding peace and forgiveness. Andy and Fr. Mulloy then spoke with the Diocese of Fargo's Fr. Tim Schroeder about a commitment his parish has made to building a school for the children and teachers at a sister parish in Haiti. Finally, our hosts visited with Joni Osnes about the upcoming Fall Festival at Our Lady of the Black Hills Church in Piedmont, SD. In the first hour, hosts Andy Shaw and Fr. Michel Mulloy began by talking with Jodi Altonen, 1st Grade teacher at Stella Maris Academy in Duluth, about the fun way her classes honor the saints in celebration of All Saints' Day. Fr. Mulloy then talked about the need to be conscious of the spiritual battles that are all around us, especially on Halloween. Finally, our hosts visited with Dr. David Anders, host of EWTN's Called to Communion and keynote speaker at the upcoming RPR Rapid City Fundraising Banquet, about why people leave the Church and what keeps them from coming back.